6mi-long Sentinel Ridge in SEKI NP is found on the south side of Kings Canyon, running from the highpoint at Mitchell Peak in the west to Sentinel Dome in the east, eventually dropping down to Sugarloaf Creek as it empties into the Kings River. I had been to Mitchell Peak six years earlier, starting from the Marvin Pass TH. A trail climbs for three miles from the TH to the summit, but the rest of the ridgeline is all cross-country. I had spent the night at the TH, the only vehicle there the whole night and next day. Construction work on the access road has closed the road between 8a and 8p, Mon-Fri, with only two 30min openings starting at 12p and 4:30p. This meant I would have to time my departure for one of these two windows if I didn't want to wait until after 8p. I was up early at 5:30a and hiking soon after 6a by headlamp, thinking I might make the earlier window if things went well. I used the headlamp for the first mile or so, the time it took to reach Marvin Pass. The signs at the trail junctions have all been removed by vandals ( a sign at the TH indicates as much) but the trails are still well-marked and since I knew where I was going, had no problems. I turned left, heading southeast for another half mile, then north at a second fork for the Mitchell Peak Trail. It is odd that the trail circles around to the north side when it could reach to the summit far more directly, but it mattered little since I wanted to go around the north side anyway to access the rest of Sentinel Ridge. The end of the trail portion and sunrise came about the same time as I struck off through the forest understory towards the east. From this point, the cross-country distance to Sentinel Dome is about 4.5mi, short enough to be done in a couple of hours if the terrain cooperates, long enough to become an all-day grind if it does not. I was happy to find much of the ridge an easy stroll through forest understory though there were sections of rock and boulders that were less cooperative and quite a bit of undulations that kept me going up and down along the length of it. An old cattle fence used to run from near Mitchell Peak to the midpoint of Sentinel Ridge, a distance about 2.5mi. The wire has been removed from the trees and posts but lies half-buried in the ground and I found myself getting tripped up on several occasions as I hurried along the ridge. With the favorable conditions on the ridge, I was plotting that if I could get to Sentinel Dome by 9a I'd be able to get back in time for the 12p open window on the road closure. I reached the Sentinel Ridge highpoint by 8:20a, only to find an imposing 20-foot summit block perched on the edge of the ridge on the side overlooking Kings Canyon. It was vertical or overhanging on all sides and it took only a few moments to realize I wasn't going to get up the thing without a rope to throw over the top and aid it. This one would have to wait. I continued along the ridge, glad to find no more barbed-wire underfoot to trip over. At one clearing there were several large trees that had been cut and left lying next to their stumps, purpose unknown. Done decades ago, perhaps they had planned to come back and cut up the trees at a later time. I finally got a view of Sentinel Dome through the trees around 9a, and ten minutes later I was at the base on the west side wondering how I was going to get up it. A tall cave/chimney on that side looked improbable (it would become my descent route), so I moved around to the north side to see what options I could find there. Several, as it turns out. The first possibility I came to looked to go up as stiff class 3. I continued further around the north side and came to what I was looking for - the easier class 2-3 way up. It was a short scramble up the slope which takes one to the upper west side slabs, a long ramp leading up to the highpoint. A large boulder perched above the slabs at first made me think I'd strike out a second time, but the boulder works out to be easily accessible from the east side and turns out not to be the highpoint. That point is a short distance east of the boulder,no trouble at all. Knowing that Gordon MacLeod had visited the summit in the 1980s, I was hoping to find one of his ubiquitous registers, but found none. The views were superb on a beautifully clear day. From the northwest to the northeast one can see much of the Kings Canyon drainage, framed by the Monarch Divide rising high to the north. To the south lies Sugarloaf Valley - the longest stretch of drainage on the west side of the Sierra Crest that flows eastward, some 8mi in length. A large stretch of the Great Western Divide from Cross Mtn in the north to Centennial in the south can be seen as well. After checking for possible routes up the east side (and finding none), I went back down the upper slabs heading off the west side, then paused when I noticed a tunnel heading downward through the granite boulders. I guessed that it might lead to the large chimney I'd seen earlier on the west side and headed down it to explore. It was a fun little bit of scrambling down small gaps in the rock, a mid-level view above a chockstone and a tight squeeze I had to go feet-first through. It took only ten minutes to find my way through, but most enjoyable. It was 9:40a by this time and it was clear I was going to miss the 12p window back at the roadway, so I changed gears to take the return at a much more leisurely pace. 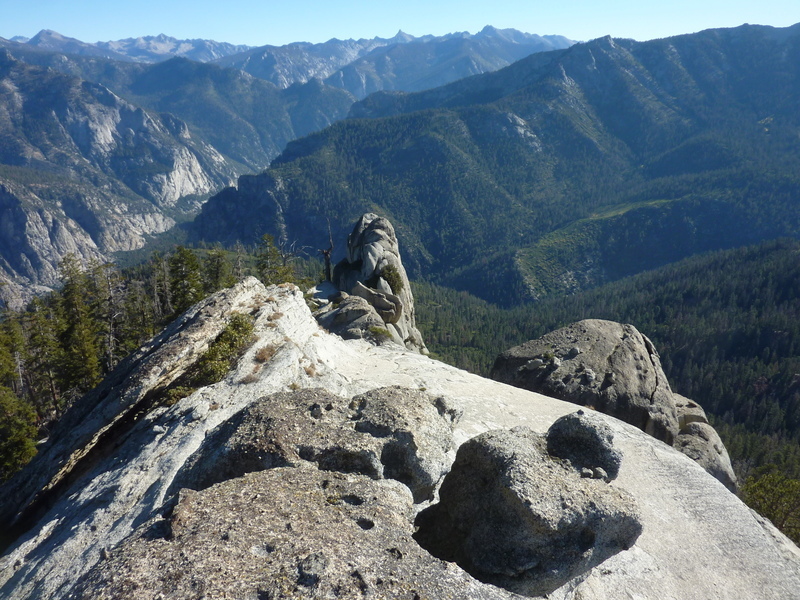 After emerging on the west side of Sentinel Dome, I spent the next hour retracing my steps back along the ridge to the summit block of Sentinel Ridge where I had another look before continuing. To the west rises Mitchell Peak and it was to this I was heading next. There's nothing tricky about this one, simply continue following the ridge west as it slowly climbs to the 10,300-foot summit. Sometime after 12:30p I made my way to the rocky top, devoid of trees and most vegetation. A concrete pad shows where a forest lookout once stood. One has to wonder if it ironically burned down. A register found at the summit was crammed full of loose paper, business cards and even a photo that appears to be a doppleganger of Tom Becht. (He assured me later that he never wears yellow). From the GPSr, I noticed that it was less than a mile and a half back to the Marvin Pass TH, about half the distance it would take following the trail. To see how this might work out, I headed WNW off Mitchell Peak, taking a beeline for the TH. Most of this is open forest understory, though lower down there is a rock avalance zone to be avoided (for tediousness, not threat of avalanche) and near the end I encountered the marshy area shown on the topo map, though it was of little concern so late in the season. Near the bottom there was also a use trail of sorts, flagged in a few places and even a cut log here and there to allow passage. It seems it might be used to move cattle from one grazing area to another. It took only about 45min to make my way back to the TH where I returned just after 1:30p. Having missed the noon window, I would have to wait until 4:30p to get a chance to drive back out to the highway. This gave me time to look around for another bonus peak which I found in Peak 8,677ft, about 2.5mi to the NNW as the crow flies. The peak has 897ft of prominence, just three feet shy of the magic 900ft that would have had it on my radar several years earlier. It looked like a short enough hike that I could get there and back before the 4:30p window. I drove back down the dirt road to the pavement at Horse Corral Meadow, then west to the Deer Meadow TH junction. This happened to correspond to where the road was closed. A very large and rounded guy came out of his truck to inform me what I already knew. When I explained that I just wanted to take a hike at the TH up the road, he acquiesced, letting me go around the sign and then up the dusty dirt road to the Deer Meadow TH. It was not surprising to find no other vehicles at the small loop of road that serves as the TH parking. A sign at the TH indicates that the trail is closed at the [Monarch] Wilderness boundary due to lingering fire damage, but one is free to hike up to that point. It then state anyone hiking past that point "does so at their own risk." Huh? Isn't that the case anytime one ventures out on a trail? Regardless, the summit I was after was only a mile and half up the trail, well before the Wilderness boundary. I hiked north up the trail as it climbs about 800ft going over the west shoulder of Peak 8,677ft. I left the trail after a little more than a mile to head cross-country over the peak's slightly lower southwest brother, Pt. 8,644ft. This summit has open, clear views, a small cairn and a fire pit, but not really the highpoint. I had to drop off the east side through forest before climbing up to the actual highpoint which has almost no views whatsoever. But where it lacks in view it makes up for it with an unexpected summit experience. There are two striking pinnacles set among the summit rocks and trees. I climbed the one to the east first, class 3, but found it several feet shorter than the western pinnacle. That one was considerably harder. The only possible (for me) route I could find was a chimney/crack system running up the north side of the block, nearly vertical for about 15ft, a solid CA class 4, I'd guess. The two parallel cracks allowed me to shimmy my way up, though not without some huffing and puffing and a dash of trepidation as I considered just how long it would take someone to find me if I peeled off and dashed my skull against the rocks below. Luckily that remained just a thought experiment and I managed to get up (and back down) without incident. I left a register here for the next unsuspecting visitor to come across, after which I returned to safer ground.